Dictionary of Numbers, quantity in human terms. Dictionary of Numbers is an award-winning Chrome extension that tries to make sense of numbers you encounter on the web by giving you a description of that number in human terms. Like a dictionary describes words you don't know in terms you do, Dictionary of Numbers puts quantities you're unfamiliar with in terms you can understand. Because "8 million people" means nothing, but "population of New York City" means everything. Dictionary of Numbers searches through the page for numbers it can understand, and when it finds one, adds an inline explanation for that number in human terms. Try hovering over some explanations to see more! Get human explanations of numbers instantly as you type them by clicking on the extension icon! Beta Feature. 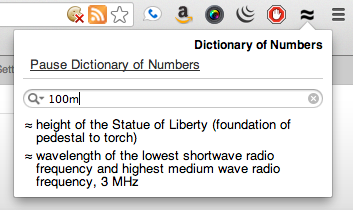 Dictionary of Numbers will suggest human explanations for numbers you type into certain text boxes on web pages. Currently does not work for Gmail or Tumblr. Try it on Reddit! Dictionary of Numbers is a research project. Learn more about the rationale behind it and ways it could be improved. Dictionary of Numbers is by Glen Chiacchieri and is licensed under a Creative Commons Attribution-NonCommercial 3.0 Unported License.